It’s fun to keep an eye on Antoinette Beenders, to see what she’s got up her sleeve for new hair style creations. As Aveda’s, global creative director, she is a recognized visionary and creative source in the world of hair styling. Her list of awards and achievements is extensive, from British hairdresser of the Year in 2004, to Master of Arts Award from Horst Rechelbacher, founder of Aveda Corporation. The collection of women short cuts she shows in American Salon, are all strong hair shapes with maximum shine. 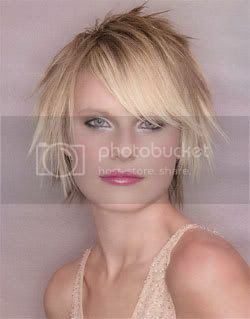 Strong lines are given to a short bob that is ear-length with straight heavy bangs and a blunt cut perimeter. Styling this cut straight and smooth and creating maximum shine with hair color and product makes this a true Vogue, look. Other women short cuts Antoinette shows in this issue resemble throwbacks to the 60’s and early 70’s. They include a short boyish hairstyle like Mia Farrow wore in Rosemary’s Baby and classic halo short cut (think Julius Cesar) with a new twist. The December issue of, American Salon Magazine, recognizes Beenders and 19 other leading hairdressers for their outstanding contributions to the industry. Hat’s off to the editors who put this piece together and gives these dynamic women well deserved recognition! Your hair salon may not have this women short cuts issue out for public viewing, but ask, almost all hair salons subscribe. September 19, 2012 By: Barb Quinn Hairstyle Blog Leave your comments (0), Your input matters.